Concepts: Escape the Dark Castle is a heavily atmospheric fantasy dungeon crawl adventure, with heavy rogue-like elements. Players control characters, each of who is hardly the classic hero types and possess only basic skills and dingy, rusty weapons. The game is laid out over a series of cards, with each card representing an encounter and challenge that must be played through on the way to escape the castle, rolling dice and working together cooperatively in order to win. Writing: This is a game that sets a strong aim of creating a distinctive atmosphere, and as a result the writing is very appropriate. Descriptions for monsters positively drip with gore and grotesquerie, and your characters are presented as terribly weak and fragile – not warriors or wizards, but bakers and blacksmiths. The game’s instructions are clear and simple – after our first quick read, we never had to consult the rules again during our play. Mechanics: Each player starts off the game with a handful of health points number of dice, based on their chosen class – each dice has a specific set of icons, meaning that certain characters are more likely to roll some icons than others. From the main deck of encounter cards, players deal a number of cards face-down – each turn they will turn over one of these cards and attempt to pass the encounter listed therein. At the bottom of the face-down cards lurks one of a handful of ‘boss’ cards, which must be defeated in order to Escape the Dark Castle. The number of encounters is considerable, ranging from eluding traps to fighting vicious monsters. Typically these can be overcome by a dice-rolling contest, attempting to match icons to those required as listed on the card. Failing to roll successfully can mean that the monster blocks the attack, and failure to kill the monster means that it will deal damage to the players. If you ever played the classic HeroQuest, this will feel familiar to you. However, the vast majority of the cards have their own specific rules. Those rules are usually penalties to increase the game’s already fiendishly hard difficulty. But if you win, you get a prize! The prize is usually an item, things like rusty half-broken weapons or a piece of mould-ridden bread. Design: In case you haven’t been able to guess yet, this game is designed to be very difficult. Much like the Dark Souls games, it seems to relish in the challenge that it poses to the players. This is replicated in the game’s artistic style – each card has an illustration which is both grotesque and gruesome. The artwork is actually fairly reminiscent to me of several cartoons such as Magnus Carlsson’s Robin and Mr. Pickles from Adult Swim. Artistic taste is a very subjective thing, and personally I find this style of illustration to be phenomenally unpleasant – it looks as if it would smell foul and be sticky to the touch. In that sense, it is excellent for the style that the game is aiming for and definitely achieves its intent! Seriously, it is excellent – but I still don’t want to touch the cards. Playability: When we sat down to play this game at our local board game cafe, several people that worked there advised us that the game had yet to be beaten. Despite the default mode of the game featuring only fifteen encounters, each one is of a considerable level of challenge and any source of healing is extremely uncommon. It quickly becomes evident that in order to survive, players need to work together to spread out the potential risk between the group. This is very much a cooperative game through and through, with loot that will need to be divided out carefully and with forethought. Going from one deathtrap of a room to another may quickly grow boring, but this game is designed to ensure that each room is distinctive, unique and sharply challenging. Conclusion: I can certainly see the appeal of Escape from Dark Castle. The random nature of each adventure ensures that every play will be different, and the atmosphere is dense with heavy mood. Characters feel fragile and have to struggle for every vistory and beneficial item, and it strongly pushes a steep difficulty curve that a lot of people will love. But, in what I’m sure will be a shocking last-minute twist, none of those people are me. I’ve already mentioned my issues of the game’s artwork, which is entirely my subjective opinion, and equally so is my dislike of the gameplay itself. 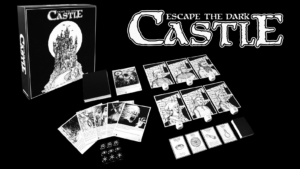 Although I am certain that many players will find the unpredictable and challenging nature of Escape from Dark Castle thrilling, I simply didn’t care for it. The random nature of the cards and loot rewards mean that even if you can develop a strategy for dealing with individual encounters – a process that almost always is contingent on fortunate, frantic dice-rolling – it still comes down to the luck of which encounter cards make up your journey. No amount of the sheer considerable variety from encounter to encounter really makes up for the fact that, at heart, you’re simply rolling dice to not die. 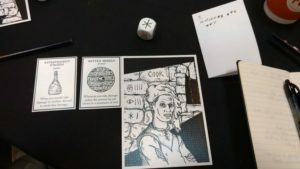 In my first play of the game, we were able to make it through the first half of the game with no problem at all, only to die following the course of three encounter card which no amount of strategy, planning or quick-wittedness could help with. I think that’s an experience that is rather the point of Escape the Dark Castle – it is a game which a large section of gamers will love. They will love the thrill of running in without knowing what to expect, with nothing but hope and fortune to see them through. And that’s entirely valid, and I take those opinions into account in the game’s score. But it’s not for me. 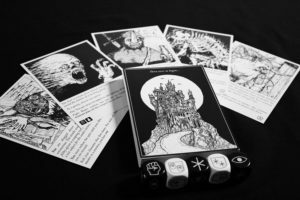 FINAL THOUGHTS: Escape the Dark Castle offers a dark, mysterious experience for those who love to try to squeeze victory by the skin of their teeth. It is a game in which things are done TO you, and your choices are either to survive or die – if you dislike that, avoid this. But if you love densely atmospheric rogue-like dungeon adventures and can parse the artistic choices, this is a good addition to your game cupboard.